Life always seems to get a little crazy around this time of year. We get caught up in school events, hockey, work, finishing up the summer garden and prepping for winter, but no matter how busy we get, I always set aside time to make apple butter. Whether we use purchased apples or pick them ourselves, I look forward to doing this work every year. I use one of those hand slicers that cores the apple and makes eight wedges, and I toss the apples into the slow cooker as I slice. The boys are usually nearby, sneaking apple wedges whenever they can or asking if they can help sprinkle on the sugar and cinnamon. As the apples cook down and the aroma fills the house, it reminds me of autumns gone by and the smell of my mother’s fresh baked apple pie, the taste of my grandmother’s apple butter that they made in a large copper kettle over an open fire, the work that they put into the food that we all ate. Every time I make apple butter, I feel their presence, a connection to the past that streams through to the present and infuses my mind with good memories. In some small way, making apple butter pays homage to all the women in my family, a recognition of how hard they worked to take care of all of us. I can call my mother and tell her about how we made apple butter again, and oh how I wish I could call my grandmother and tell her, too. She could talk at great length about how she prepared food, and I wish I could have one of those conversations with her. Because that is how I remember her; in the kitchen, making food for everyone. After trying many different kinds of apples, I’ve settled on Galas for making apple butter. They are slightly sweet on their own, and so require less sugar, plus they cook down very nicely. I start a pot of these in the evening and finish it up the next afternoon. Adapted from Not Your Mother’s Slow Cooker Cookbook, by Beth Hensperger. Makes 5 to 8 cups. 3. Use an immersion blender (or jar blender) to puree the cooled mixture until it’s very smooth. Store covered in the refrigerator for up to 2 months or in the freezer for up to 3 months. You may also process jars using the boiling water method. Beautiful post Andrea. Thank you for the warm memories! I love this idea, and I have that slow cooker cookbook too! Isn’t it a great book? So many good recipes. So the skin just evaporates and gets broken up in the blender?? It certainly looks smooth and lovely in the picture above! Yes, the blender purees the softened skin, which helps make the apple butter nice and thick. This sounds fabulous. I miss the taste of apple butter, it seems so long since we have had it and I resist the temptation for store bought. I am going to try this over the weekend. This recipe looks great! Just one question–how long should I process the jars? Hi Nicole. 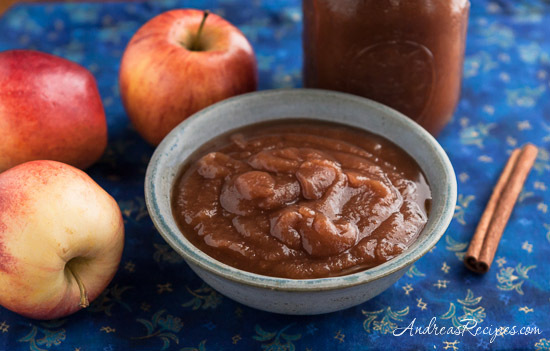 Apple butter should be processed for 10 minutes in a boiling water canner. Just wanted to let you know, I tried this recipe last night with some aging golden delicious and crispy Washington Jazz. I havent tasted it yet, but it looks and smells amazing. And if apple butter was really this easy to make, I don’t think I’ll ever buy it again! PS- It tastes even better than the local orchard variety. Thanks Keely, I’m so glad you liked it!